Fish is in high demand as a superfood rich in omega-3 fatty acids, but the oceans may not be able to keep up the supply because of unsustainable fishing practices. 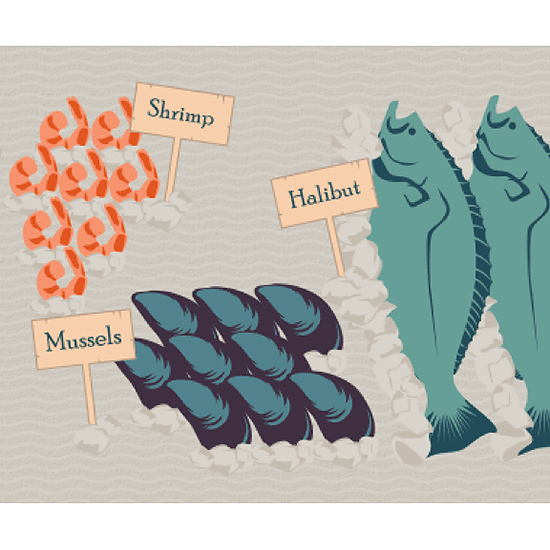 Learn how your seafood choices can meet the ocean’s health goals as well as your own. If you’ve ever gone fishing, you’ll know the number-one thing to bring along is patience. Hours of planning, bait selection (see Mike Cork’s article for just a taste), jigging, and drifting can result in little more than hot dogs on the plate at the end of the day. So it’s almost inconceivable that supermarkets across the world can be fully stocked with seafood all the time. How is that even possible? Well, the fishing industry has a few tricks up its sleeve, and some of them are dirty. Years ago, when fish were plentiful, it wasn’t that hard for skilled fishermen to supply their families and the morning markets with enough seafood to satisfy. 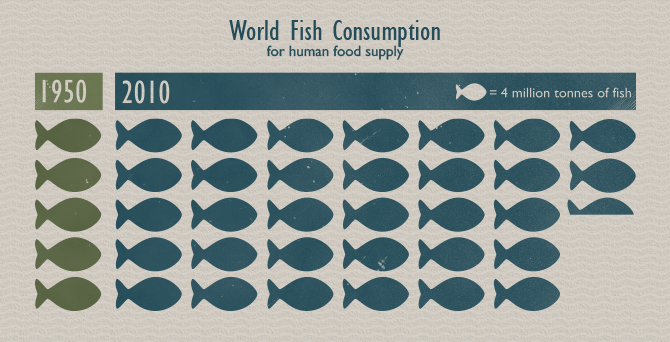 In 1950, world fish utilization for human food supply was just under 20 million tonnes. But as the demand for seafood increased, fishermen had to use new methods to keep up. Technological and scientific advances gave them bigger ships with more storage; better nets, traps, and trawls; and a less mysterious ocean due to sonar and fish biology research. Steam forward 60 years to 2010, and fish utilization for human food supply was almost 130 million tonnes, plus 20 million tonnes for non-food uses. We really like our fish, and no wonder with all of those tasty health benefits, but at what cost? While those new technologies clearly increased catches of targeted fish species, some of them also increased catches of non-target species – bycatch – and damaged habitats along the way. Now juvenile fishes, turtles, birds, and non-commercially-valuable fishes were being killed too. I don’t know about you, but I wouldn’t be as impressed with my friend's 30-pounder if he had dragged a net through a whole lake, dumped everything on the dock, and sorted through it until he found the biggest one, having destroyed the entire ecosystem along the way. Fishing became so efficient that 85 percent of marine fish stocks are now either fully exploited, overexploited, depleted, or recovering from depletion. This leaves only 15 percent with room for growth (and it ain’t salmon or tuna). Fishing like this isn’t sustainable, so we’ve turned to farming to bring the fish to us. It looks great on paper, but as with livestock, there are numerous problems with disease and pollution that need to be considered and carefully controlled. It hasn’t been pretty thus far, but the tides can still turn. There are a lot of sustainable fisheries out there, including farms. There are certification programs for sustainable aquaculture (Aquaculture Stewardship Council) and sustainable seafood in general (Marine Stewardship Council) as well as lists of recommendations (Seafood Watch and SeaChoice). I use the three Ts to choose seafood. Almost every type of fish can be a great choice or one to avoid depending on the territory in which it’s caught and the fishing technique being used. Let’s see how this boils down for two popular fishes: salmon and tuna. So, farmed salmon with few exceptions is a poor choice and tuna caught by troll and pole is a universally great choice, except for bluefin tuna, which should be avoided no matter what. I can remember that. Fishermen are trying, scientists are trying, all we need is the citizen army to make “sustainable” as sought-after in the seafood section as “organic” is in the rest of the supermarket. Search MSC’s shopping database before you head to the store, print out Seafood Watch’s pocket guide or use its app, and check out fish2fork to find a restaurant. Seek out and support fishermen, companies, supermarkets, and restaurants that deal in sustainable seafood, and ask the others why they don’t. If you’re a real afishionado, you might even find a community-supported fishery like Off the Hook to support. Patience is a virtue when it comes to fishing, but if we don’t up the impatience now, we’ll end up eating hot dogs far more than we care to.